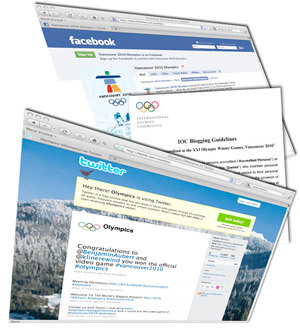 Are the 2010 Vancouver Winter Games the first "social media" Olympics? UBC Okanagan sociologist Christopher Schneider, an expert on social media and their impact on our lives, says coverage of the Games is no longer entertainment. It's infotainment. And, he says, social media technology such as Facebook and Twitter are changing the way we experience the Olympics. "News agencies have changed the model and structure of their format to better reflect recent developments in social media," says Schneider, an assistant professor of sociology with the Irving K. Barber School of Arts and Sciences. "Information gathering and dissemination, like never before, is now instantaneous through a multitude of outlets from a variety of people, from individual citizens to Olympic athletes," he says. "The International Olympic Committee, for example, has a Facebook page that has over one million followers and Twitter has published a list of 'verified' Tweeting athletes." Social media have dramatically influenced how messages are modified, packaged, shaped and disseminated to various audiences. "They have moved communication and information beyond the scope of traditional media such as print, radio and television," Schneider says. "As a result, audience expectations have shifted coverage of the Olympics from an entertainment-oriented format to an infotainment-driven format." Examining these changes lends some key insights into our understandings of the fundamental character of the Olympics as well as our understandings of the modern social order. Seemingly everyone has become a journalist, a reporter or narrator of events, while control and sponsorship of information has become increasingly important, says Schneider. "Consider recent decisions concerning police surveillance tactics," he says. "For example, Indigenous activist Dustin Rivers was recently questioned by police over some critical content posted on his currently suspended weblog http://www.liberatedyet.com/ in relation to the 2010 Olympics." Famed Canadian media theorist Marshall McLuhan is best known for his book "The Medium is the Massage" where he argues essentially that the delivery medium of information is, in fact, more important than the delivery of the information itself. "In this sense, technology is the message," Schneider says. "And it has increasingly changed the way in which people consume the Olympics."